We offer this history of The Islander and past Island newspapers beginning in 1947. On Nov. 25, 1992, we published our first edition as The Islander Bystander. Island news — since 1947. Anna Maria Island’s first newspaper was not a newspaper — at least according to the newspaper. At that time, Bradenton Beach was the population center on the Island — where there were only about 900 people and 470 houses Islandwide. Anna Maria incorporated as a city in the 1920s, but the cities of Holmes Beach and Bradenton Beach were not yet incorporated. “Everybody on the Island is informed of everything that happens about 35 seconds after the event.… There is no reason why a newspaper should exist on this Island, where every man is a leg-man and every woman a crusader. Kersh packed up his entourage and left his residence at the Gulf Park Hotel shortly after his first and only edition of The Beachcomber — never to be heard from on Anna Maria again, according to Blassingame. She said he was disgruntled by what he considered a general lack of hospitality from pub owners — toward his dog. The first continuously published newspaper on Anna Maria Island, Anna Maria Key News, was started in 1949 by Ellen Brackin (later Ellen Marshall of Anna Maria) and Harriet Williams (later Harriet Blair of Sarasota). When she came to the Island in 1947, Marshall was a war widow and stayed at Angler’s Lodge on the bay. She became friends with Harriet and together they published the weekly newspaper. The Key News was an immediate success. On the front page of the Sept. 7, 1950, issue, Marshall wrote how an unnamed hurricane flooded the Island, causing considerable damage. But she emphasized that the natives rose to the occasion. The major controversy on the Island in the early months of 1950 was whether Anna Maria Island should have several municipalities or be one community, the Key News reported. The city of Anna Maria had incorporated in 1923 with Capt. W. “Mitch” Davis as mayor. But by 1950, in the wake of the post-World War II boom, sentiment had grown for the incorporation of the southern portion of the Island. On March 13, 1950, 61 of 75 mid-Island residents voted to incorporate and voted 49-12 for the new city to be named Holmes Beach with Halsey Tichenor Jr. the first mayor. On Dec. 21, 1951, Bradenton Beach became a city by a vote of 84 to 56. Bernard Wagaman served as its first mayor. The Anna Maria Key News ceased publishing on March 1, 1951. Our copy was courtesy of Snooks Adams of Holmes Beach. Another copy we possess — only of the front page — is from the June 15, 1951 edition. Holly’s newspaper changed names from Your Island Newspaper to The Island News, but didn’t last long either way. Tripp says Holly left the Island for St. Petersburg and may have stayed in the newspaper business, but didn’t stay in touch. “We met somehow and learning of my background in advertising, Holly asked, ‘How good are you at collecting money?’ I went around to see some merchants — there wasn’t a lot of them — collected some money and sold some more ads, but as I recall it was very short-lived. I don’t think it lasted more than year,” Tripp said. Indeed, on Nov. 15, 1951, the first edition of a new Island newspaper, The Islander, rolled off the presses. It was eight pages with no subscribers and no advertisers. Circulation was 500. There was no bridge between Anna Maria Island and Longboat, and wouldn’t be for another six years. The only way to drive to the mainland was via a rickety wooden bridge from Bradenton Beach to Cortez. Harry Varley was the founder, editor and publisher. Varley was no newcomer to the publishing business. Having been with a New York City advertising agency for years, he went on to become president of Schick Razor Co. before coming to Anna Maria. Varley originally came from England and was known for his outspoken manner, weaving editorial comment with news stories. In his 1971 Islander obituary, future editors Don Moore and Steve Kimball wrote, “To say he was well-liked would be only half true. To say he was disliked would be no closer to the truth. “In the newspaper profession, it is axiomatic that an editor — if he is doing a good job — never will win any popularity contest. It also is said that the true gauge of an editor’s worth is not necessarily the number of friends he has made, but the number and caliber of the enemies he has made. Varley’s tenure at The Islander lasted eight years when in 1959 the paper was handed over to Judd Arnett. For five months, Arnett and his wife ran The Islander, then went back north where Arnett became a columnist for the Detroit Free Press. Steve Kimball took over following Arnett’s departure. Kimball bucked the popularity trend of editors and later became mayor of Anna Maria City. As the Island grew, Kimball switched the focus of the Islander to providing hard news coverage of local events. He is credited with changing the printing process from letter press to offset printing. Like Varley, Kimball voiced his opinions on subjects of importance to the community, but unlike Varley, Kimball limited his comments to the editorial page. It was a page that spoke with authority but did not try to drown out other points of view. In the early 1960s, Don Moore joined the staff and in 1970 became the third editor and publisher after he and his wife, Roxanne, bought the paper. A University of Florida School of Journalism graduate, Moore had innovative ideas and a “tell it like it is” style that would win the paper many awards. Under Moore’s guidance, The Islander expanded into the commercial printing business on Jan. 3, 1974. The plant not only produced The Islander, but several other small papers from around Florida. The Islander won a number of Florida Press Association awards with Moore at the helm. By 1974, the paper garnered two national awards, something no other Florida weekly had accomplished. Moore’s younger brother Colin joined the paper in 1977 and became editor when Don Moore sold his publishing business, including The Islander, the Bayshore Banner and the printing operation in May 1980 to The New York Times. But that was not to be. In 1984, The Islander was again sold, and again it became a family-owned paper. Richard Ingham, owner of the Zephyrhills News, bought the paper and appointed his son Sky as publisher. Ingham eventually changed the paper’s name to The Anna Maria Islander Press. June Alder, a veteran reporter with the paper, succeeded Colin Moore as editor but left the position in May 1985 to return to her first love — reporting what she termed “the always fascinating news” on the Island. Shirley Foor, a former Bradenton Herald managing editor, replaced Alder, with Dennis Ecklund later succeeding Foor as editor. The Islander Press printed its final edition in on July 25, 1990. Pat Copeland, then editor, said staffers were dismayed over the paper’s demise. In 1954, Bob and Gret’n Daughaday had started a “shopper” based in Holmes Beach and a local woman (grandmother of former Islander reporter Mark Ratliff) named it The Beachcomber in a write-in contest. The Beachcomber was sold in 1976 to the Bradenton Shopping Guide and Bette Kissick managed the popular shopper from 1976 to 1990. They began printing on its trademark yellow newsprint in 1977, but never published Island news. The Beachcomber was acquired along with a group of shoppers in 1988 by Westminister Publishing, which in turn eventually sold to TS Publications Inc., an affiliate of the Toronto Sun Publishing Company. Meanwhile, Don Moore had returned to Anna Maria in January 1989 to launch a new weekly paper, The Island Sun, in direct competition with the languishing Islander Press. Competition for advertising dollars from the Sun and Beachcomber were blamed for the demise of the Islander Press. Within just a short time, Moore’s staff and some investors were stunned by the sale of the eight-month-old Island Sun to TS Publications. Editor and publisher Don Moore made the agreement to sell his second Island publication in 1990 following a heart attack. TS continued to publish The Island Sun along with a made-over Beachcomber, including entertainment news, for two years. They renamed it TGIF (Thank Goodness It’s Friday) Beachcomber and inserted it weekly as a second section in the Sun. In November 1992, TS Publications announced plans to transform its weekly newspapers, The Island Sun, TGIF Beachcomber, Longboat Times, Sarasota Times and two shoppers, Sarasota and Venice, into one regional paper, The Weekly. With a predicted absence of Island news in The Weekly, advertising agency owner Bonner Presswood, operating MacBonner Inc. in Holmes Beach, seized the opportunity to launch a newspaper that would serve the needs of the Island community. Presswood already operated a storefront for her agency in the Island Shopping Center, and agency staff members pooled their resources and began selling advertisements. Joy Courtney, a former Island Sun writer, signed on as the paper’s first editor and the newspaper, named The Islander Bystander, managed to hit the streets with its first edition the same week that TS Publications converted its publications to The Weekly. “We were 12 pages the first two weeks, then 16 pages, 20, 24 and so on, until we hit 40 pages during the first season — based on the volume of advertising. It happened so fast that we were all swept into perpetual motion,” says Presswood. The Islander Bystander staff had many contributors from an assortment of former Island papers including long-time cartoonist Jack Egan, June Alder, Pat Copeland, Paul Roat and Courtney, who stepped down from editor to school reporter when her business, Haley’s Motel, demanded more time. Presswood was an advertising sales representative at the former Islander newspaper in 1978. She went on to help launch Clubhouse magazine in Bradenton and Sarasota — now Sarasota magazine — and provided consulting to other start-up publications. “When it was evident the Island Sun would cease publishing, I pooled the resources of everyone that could help generate the news from three cities, write about the people who live here and sell ads. All the while I sought to revive the spirit of the former Islander in The Islander Bystander,” Presswood said. 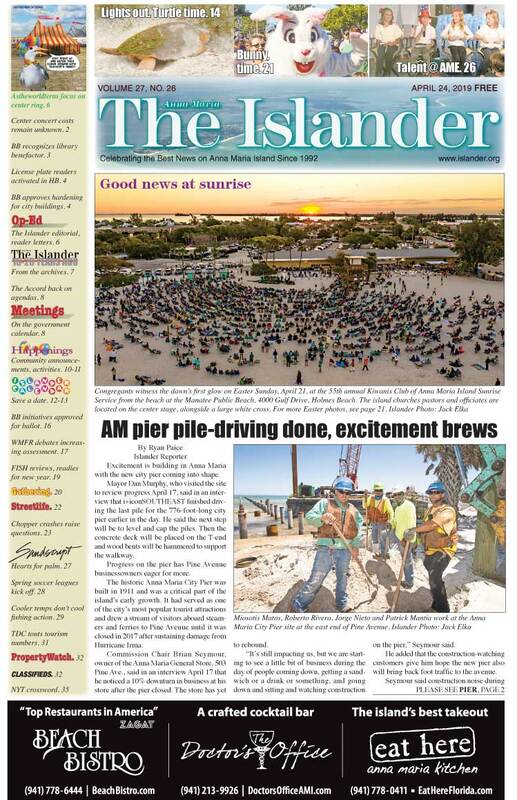 The Islander Bystander evolved, and lacking any copyright or name ownership for the former newspaper, the new Islander dropped its “Bystander” and became again, simply The Islander. The Islander withstood two competitive challenges from the Island Free Press, February to October 1993, and from the short-lived Dolphin newspaper that folded in October 1995. Anna Maria Island’s premiere weekly newspaper — the newspaper of record for the Island communities and three city governments — maintains a circulation of 16,000, serving readers on Anna Maria Island, Longboat Key, Cortez and west Bradenton. “I’d never have thought this would be possible when I worked for The Islander in the 1970s. I thought that paper would be around forever. But I’m happy to fill that void,” said Presswood, who also dropped part of her name to become Bonner Joy. Association to validate our credibility. Our awards have come primarily from news and editorial content, not fluff, and it’s really something to be proud in when considering our peers. The last two summers I have spent my vacation on the Island, driving around all the old familiar places and discovering gems. Oh, how I miss the Island of yesterday and, sadly, my grandfather passed away in 1996 and my grandmother passed in 2016. I’m Don and Roxanne Moores daughter and remember when my parents owned the paper and I worked for my dad when he returned to the island. I remember many of the people you mentioned in your write up. Interesting story. Interesting reading. Got to admit it was an interesting time back in those days. BTW I am still drinking my coffee from an Islander Bystander cup…..